Scoliosis generally develops during childhood, but it also can occur in adults. Adult scoliosis is relatively common. Scoliosis generally develops during childhood, but it also can occur in adults. Adult refers patients who have completed their growth (i.e., are over the age of 18 or have gone through puberty). Adult scoliosis is distinctive from childhood scoliosis in terms of the causes. In addition, the goals of treatment differ in skeletally mature patients. Scoliosis is a musculoskeletal disorder that adversely affects the shape of the spine (backbone). The spine is composed of bones called vertebrae. Normally, when viewed from behind, these bones (vertebrae) run down the back in a straight line. There are normal (front-to-back) curves of the spine; however, scoliosis is a side-to-side curvature of the spine. Therefore, a scoliotic spine (when viewed from behind) will not be straight and may instead look like the letter "C" or "S", due to the side-to-side (right-to-left) curvature. Adult scoliosis is relatively common compared to other musculoskeletal diseases. Idiopathic simply means of unknown origin; therefore, adult idiopathic scoliosis means that the exact cause of scoliosis is not known (i.e., there is no clear cause). Adult degenerative scoliosis is caused by the combination of aging and wear & tear on the structures of the spine. Post-surgical deformity occurs as a result of previous surgery for scoliosis or spinal fusion. 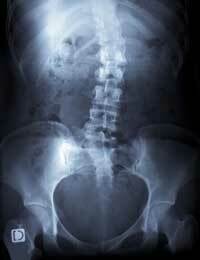 This is type of scoliosis is typically seen in patients who previously had long fusions of the spine. Neuromuscular scoliosis is caused by diseases that adversely affect nerve and muscle function. Muscular dystrophy, cerebral palsy, and polio are examples of neurological conditions that affect muscles and can lead to the development of scoliosis. Adolescents with scoliosis rarely have pain; however, adult patients with scoliosis often have with a variety of symptoms. These symptoms are typically due to degenerative changes in the adult spine. Adults can experience a gradual loss of function and a decrease in the ability to accomplish daily activities.